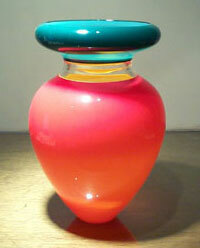 Staff "Pick of the Month"
"Lino at Pilchuck Glass School"
it holds the volume within." Thus Sonja Blomdahl, our "Artist of the Month", begins to describe the intimacy of her creative process. "If I have done things correctly, the curve of the piece is continuous, the shape is full, the opening confident." Sonja is well known for the beautiful, classically voluptuous forms of her work, which embody a timeless aesthetic and sense of proportion. "As a human being, scale and proportion come from my body. In the past several years, the shape of my pieces has undergone a change … The newer pieces in particular seem to reference the human form." work. "Color is often the ‘joy’ of making the piece" she says. 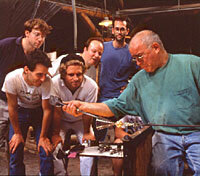 Sonja Blomdahl’s journey with glassblowing began in 1972 when, during a life drawing class at the Massachusetts College of Art, she was distracted from her efforts by the sound of laughter and noise eminating from another floor . Propelled by curiosity, she followed the noise to the glass shop, where she saw glass being blown for the first time, and was immediately attracted to it. It requires constant maintenance and rebuilding." On the other hand, "Having a studio allowed me for the first time to seriously develop my own work. I take each piece myself, from start to finish, with the help of an assistant." Sonja has been on the faculty at the Haystack Mountain School, the Pilchuck Glass School, and presently serves on both the Advisory Board and the Board of Trustees at the Pratt Fine Arts Center in Seattle. 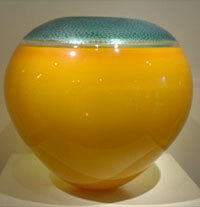 Her works can be viewed in many Museum Collections world wide, including the American Craft Museum, the Corning Museum, the Museum of Fine Arts, Boston, the Renwick Gallery, and the White House Collection of American Craft. With this piece, Sonja Blomdahl has mastered the sublime elegance of all classical form, while her layering of rich color adds a luminous depth suggestive of inner light. Continuing: Holsten Autumn Group Exhibit. Continuing daily with works by all our artists. Our fall hours will be 11am-5pm, seven days. Now-Oct. 31: The Berkshire Museum in Pittsfield, MA. "Presence of Light" Exhibit continues through October 31. 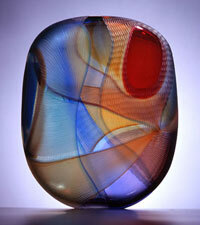 Glass Artist Sonja Blomdahl was a keynote speaker, and her work is featured in the exhibit. September 21: National Museum of American Indian Art, Washington, DC. Preston Singletary’s work will be included in the opening exhibition. October 9: National Liberty Museum, Philadelphia, PA. Maestro Lino Tagliapietra will be presented with the Museum’s "Artist as Hero" Award. Call the Museum at 215.925.2805 for further information. October 26: Museum of Art and Design, NYC. The Museum’s "Visionaries!" Award will be given to Lino Tagliapietra. Call the Museum at 212.956.3535 for further information. 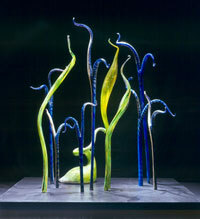 Galleries will feature two one-person shows: Dale Chihuly and Lino Tagliapietra. great artists. Call the gallery for further information. West Palm Beach, FL. Featuring new works by Maestro Lino Tagliapietra. Autumn in the Berkshires is a magical time, a soft transition from Summer, a time of crisp air and beautiful colors, bathed in the golden sunlight of September and October. Many wonderful galleries, museums, shops, restaurants, inns and entertainment venues continue to be open year-round. The gallery will be open 7 days a week this fall and we look forward to seeing many of you during the coming weeks! For further information regarding Berkshire highlights, visit the Berkshires Visitors Bureau website or the See the Berkshires website. If you are unable to visit the gallery this fall, visit us at www.holstengalleries.com.